Introduction: It is that time again when the bass are ready to spawn. 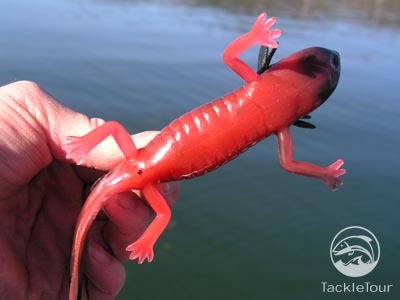 Once the fish are bedded anglers usually target them via sight fishing using soft plastics such as big worms or lizards. Now there�s a new lure in town that�ll surely "piss off" the big females into biting. 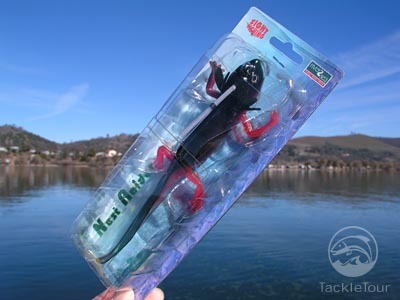 The River2Sea Nest Raider is a lure designed targeting for bedding bass. 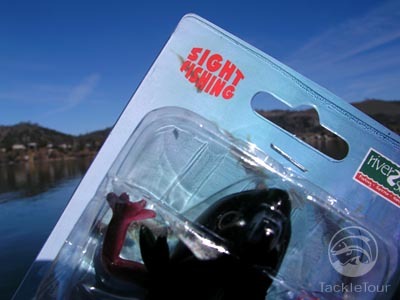 Impressions: If you�re sight fishing for bedding bass you�re most likely fishing in pretty clear waters. The more realistic the lure, the more likely the big female bass will see it as a threat. The Nest Raider is as real as it gets. 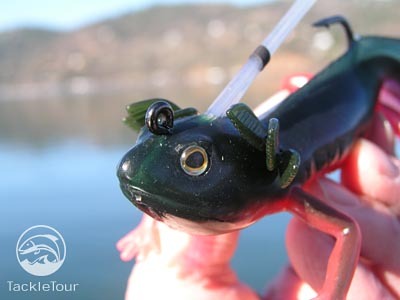 This lure resembles a waterdog (salamander) or lizard that�s ready to clean out all the eggs in the nest. 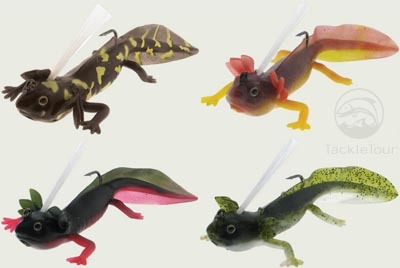 The River2Sea Nest Raider is seven and a half inches in length and has a profile similar to the real thing. 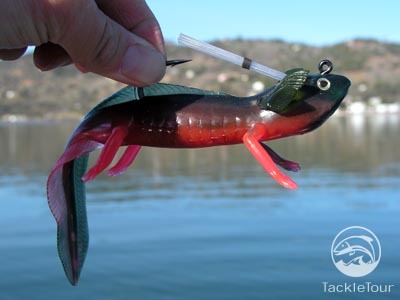 The two ounce lure has a weighted head design that makes it appear as it was robbing the nest as the air-filled tail raises the rear of the lure. The Nest Raider has realistic eyes, legs, and even external gills. The lure also includes a sharp hook, weed guard, rattles in the tail, and it is available in four different patterns. Field Tests: Though the Nest Raider is primarily designed to mimic a four legged creature raiding the nest of a bedding bass, but it can be fished throughout the season as well. At this time of the year in California, the fish are either moving up or already in beds. I fished Nest Raider in different bodies of water at all depths including deadsticking it around bedding bass. 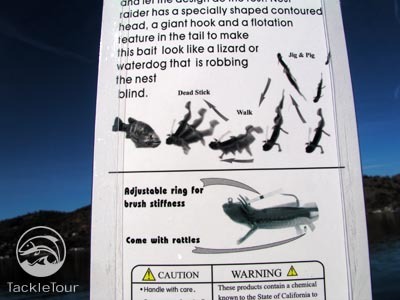 Casting: If you�re sight fishing on beds you�re most likely going to short cast or pitch/flip the Nest Raider into position which comes easy with this lure as long as you have the right rod. Weighed with a two ounce head the Nest Raider flies through the air when you want to go the distance. Just make sure your cast control system is adjusted correctly and thumb the spool to ensure your hard whipping cast won�t turn out into a nasty birds nest. Retrieving: Most plastic lures can be worked many different ways and the Nest Raider is just as versatile. River2Sea�s realistic Nest Raider can also be fished at all levels. Cast and let this waterdog bait drop to the bottom then walk it back to the boat while varying speed and even add a pause or two to the retrieve. Another effective method is to deadstick it near the bedding bass. With the Nest Raider�s size, tail-up posture, and appearance any slight movement from the current will draw strikes from aggressive females. Work the Nest Raider like a plastic jig with a trailer, just think jumbo size. Using the rod tip jig the lure up and let it drop. Jig it at various speeds depending on the activity level of the bass. According to River2Sea if you jig the Nest Raider up and let it drop down, it�s supposed to do a big loop and come back near the starting point. I wasn�t able to witness this but River2Seas has a video that demonstrate this on their website.